Producer@harrystrange.com is heading for retirement. If you are a PR person, please note that Harry Strange is an audio drama and will not be interested in promoting your clients' books, events, or interviews. Please remove this email from your list. No further action is required. If you are interested in the Harry Strange Radio Drama; our final episode has dropped and there are currently no plans to continue the show. If you need to reach out for fan information or to contact Tony, please use tony.sarrecchia@gmail.com effective immediately. Just a teaser for the Harry Strange Radio Drama final episode which drops into your feeds on July 15! The teaser features the vocal talents of Kellen Stennett, Emma Greene, Laura Corliss, Sketch MacQuinor, and Tricia Groves. Share this with everyone! Check out the latest Harry Strange Radio Drama Episode! Get ready, folks! 'Harry Strange #315 What Lovecraft Said, P2' will drop in your feeds on Sunday, May 13. Here is a little 30-second teaser to hold you over. Please share with the world. (It wouldn't hurt to review all of season 3 before the 13). and, of course, the iBook Store. What is Lady Sherlock about? This edition includes the radio script adaptation performed by the Atlanta Radio Theater Company and a teaser for the next novella. 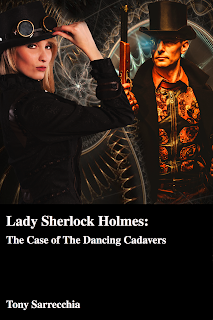 My new novella, Lady Sherlock Holmes in the Case of the Dancing Cadavers, is available for pre-order on Kindle. This is the same story that the Atlanta Radio Theater Company will perform live at 221B Con in April 2018. Order your copy now! (Note--that is not the final cover art). 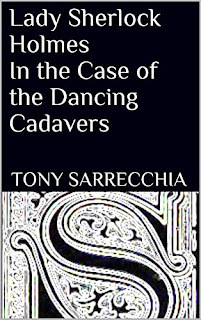 "When an undertaker’s daughter witnesses her father’s suicide, she is suspicious; when she sees cadavers dancing in his morgue, she knows skullduggery is at play. She turns to the world’s foremost, and only, consulting detective to solve the mystery. This edition includes the radio script adaptation performed by the Atlanta Radio Theater Company at a convention in Atlanta, as well as a teaser for the next novella."